Would you like to take your cruising to a new level? Original equipment on Lamborghini Gallardos KONI FSD (frequency selective dampers) are a must for fine tuning your BMW E46's ride, and handling capability. KONI FSD adjusts damping automatically, so there is no need to manually adjust the shock absorber. These shocks replace OEM shocks and actively controls stiffness, and dramatically improves handling. KONI revolutionized shocks, with the first ever adjustable shock. It comes as no surprise that KONI remains the market leader in shock absorbers. Pair these shocks up with some Eibach Pro Lowering Springs which provide a slightly more aggressive and raked stance than your stock suspension while still maintaining a comfortable ride. On average Eibach Pro Lowering Springs will lower your vehicle 1.2 - 1.8 inches, providing for a lower center of gravity and improved handling. Pro Springs feature more control than that of the OEM springs, but are still comfortable for daily use. 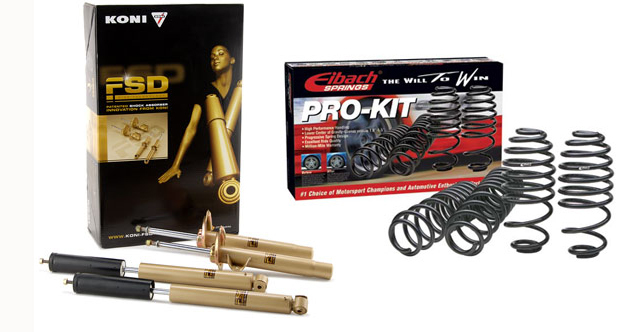 Eibach Pro Springs are an excellent choice for street and occasional track use. This Koni FSD Eibach Spring Combo E46 is the perfect suspension setup!